To qualify as a Wacker Neuson CPO piece of equipment, each machine undergoes a strict set of criteria for reconditioning. Wacker Neuson's new certified pre-owned (CPO) equipment program takes used equipment to a new level. The CPO program allows end users to purchase premium products at an affordable price with the same confidence as if purchasing a new piece of equipment, according to the manufacturer. To qualify as a Wacker Neuson CPO piece of equipment, each machine undergoes a strict set of criteria for reconditioning. Each piece of equipment is carefully selected based on how well the machine has been maintained through its service life, as well as be less than three years old, have less than 1,500 hours and pass a total fluid analysis. Once the machine is selected, it is run through an extensive inspection process. The CPO equipment is inspected and reconditioned by Wacker Neuson certified dealers. As the dealer works through the machine components, they are tested, repaired or replaced as needed to ensure it is in top quality condition and brought up to the latest standards prior to being sold. Wacker Neuson stands behind its CPO equipment by offering a number of additional benefits that are not typically found on traditional used equipment, giving peace of mind to the new owner. 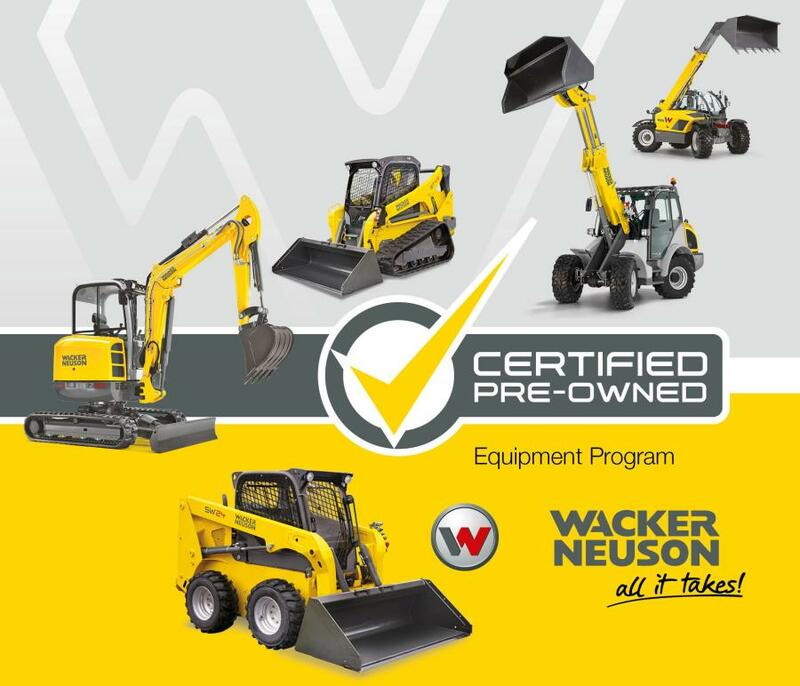 The first products available through the certified pre-owned program by the dealer network will be Wacker Neuson's material handling equipment that includes skid steers, compact track loaders, wheel loaders, telehandlers, excavators and dumpers. Coming soon will be select light equipment products. To establish contact with or review a list of CPO or quality used products visit the Wacker Neuson Used Equipment site at www.used.wackerneuson.com.